New Delhi: Indian Railways is developing itself to provide the world class facilities for passengers along with the safety concerns. In a move to innovate the rail infrastructure in India, railways is now going to collaborate with Switzerland for developing trains which will tilt on approaching a bend, just like a motorbike on a winding road. India and Switzerland have signed the memorandum of understanding in this regard yesterday. Officials said that as a train rounds a curve at speed it cause objects to slide about. “While it makes seated passengers feel squashed by the armrest, standing passengers tend to lose their balance. The design of the tilting trains counteract this,” an official said. During a curve to the left, the train tilts to the left and vice versa, the official said. The first agreement is a follow up on bilateral cooperation in rail sector as discussed in a meeting held in July 2016 between Railway Minister Suresh Prabhu and the Swiss Ambassador. 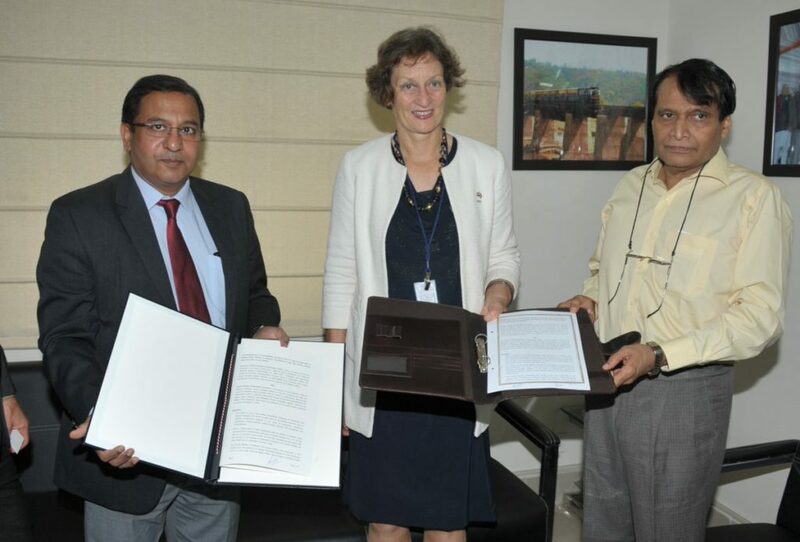 The second MoU was signed between the Konkan Railway Corporation Limited (KRCL) and Swiss Federal Institute of Technology which will help the former in establishing the George Fernandes Institute of Tunnel Technology (GFITT) at Goa especially for assimilation and dissemination of knowledge in the field of tunnelling, the officials said.